Type root at the New password prompt and press Enter (you’ll get the above error messages). 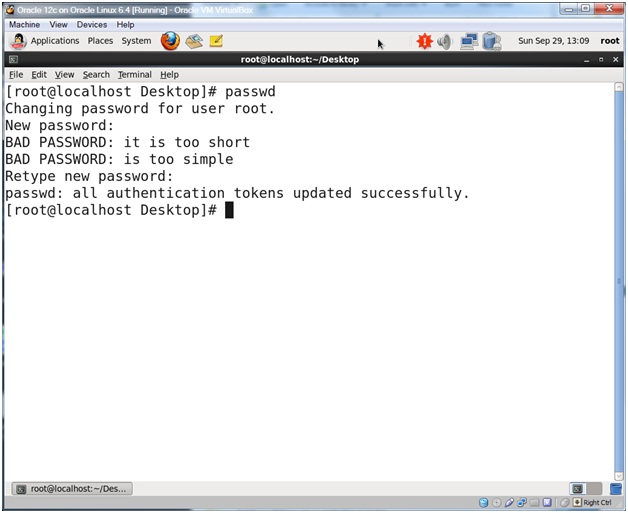 Type root at the Retype new password prompt and press Enter. See the note about Joes in the Introduction. Never use root as the root password for a system where security matters. This entry was posted on Wednesday, March 26th, 2014 at 6:07 pm	and tagged with Database Install, Oracle, Oracle Linux and posted in Code, Linux. You can follow any responses to this entry through the RSS 2.0 feed.